Examination results rise but standards fall. The New Labour legacy. Northern Ireland has no OFSTED but an ETI, the Education and Training Inspectorate, who share the same office space in Rathgael House as the DENI Permanent Secretary. 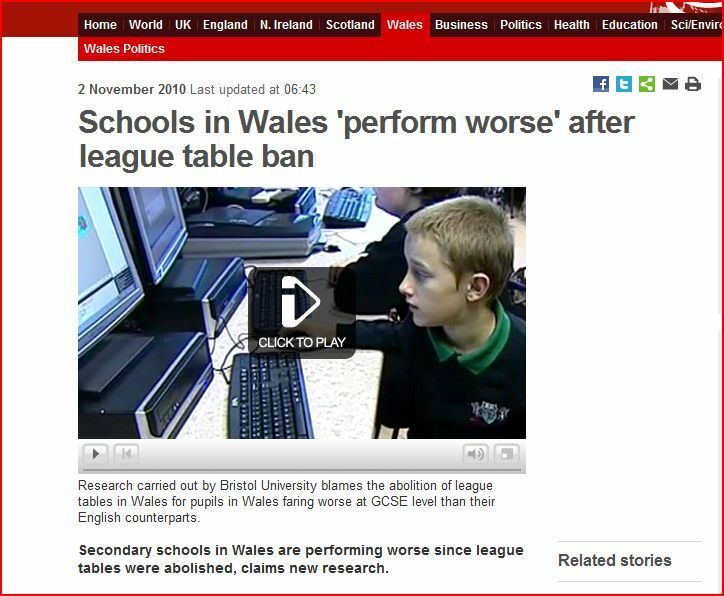 For the past decade they have had no league tables to hinder their “prizes for everyone” approach to the exams business. 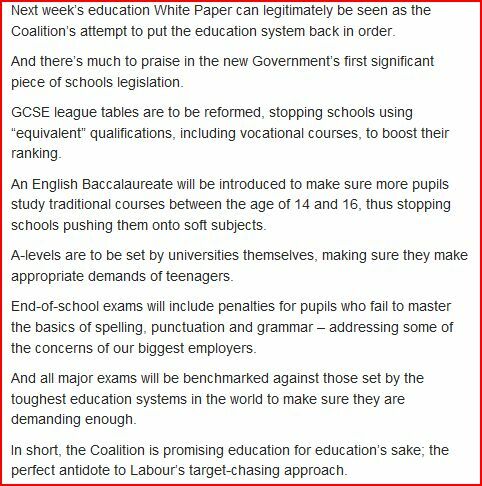 It will be interesting to monitor CCEA’s approach to reforming the examination system given their ready adoption of the equivalent subject and qualification approach adopted by the British system. It fooled noone, particularly the universities and employers. Since education is a devolved matter in Northern Ireland there may be an expectation of an immediate decline in performance if the equivalencies are removed along with a renewed emphasis on grammar and punctuation in marking examinations. To all the “social bigot” parents with children seeking a place in a grammar school this Saturday. The Education Minister wants your vote. The question and answers speak for themselves. Additional concerns raised over PPTC GL Assessment tests. the important principle addressed in testing circles – the vaidity and reliability of high stakes tests. No mention at all by the Irish News or GL Assessment or the Post Primary Transfer Consortium of any measures of the validity and reliability of any inferences to be drawn from the tests. The PPTC are directly misleading parents in their claim that the PPTC GL tests are based on the Northern Ireland Key Stage 2 revised curriculum. Since the tests were not designed exclusively for Northern Ireland and predate the introduction of the revised curriculum such a claim is unwarranted and misleadng. This issue underscores the difference between the PPTC GL tests and those of AQE whose CEA test questions match the former 11-plus tests prepared by NFER. 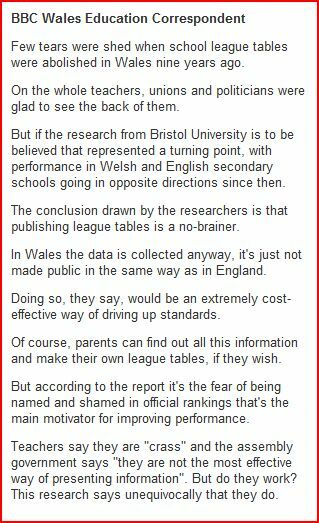 It also highlights the nonsense claim published in the Belfast Telegraph regarding Victoria College’s use of the two tests to determine admission. There can be no equivalence between the two tests. Victoria College are simply pandering to parents from two different communities in order to keep their application numbers up. Of course those adopting the inferior GL Assessment tests have persisted with the false claim to parents that talks to agree one test are likely to achieve a positive outcome. There is absolutely no likelihood of that happening since it was the anti-academic selection PPTC who broke away from the AQE in the first instance with a GL Assessment test to counter the fear that Catholic parents would abandon Catholic grammars if testing was withdrawn. Parents should note the continued silence from Finbar McCallion of the GBA who appeared regularly over the summertime on the airwaves of the BBC promising resolution of the single test conundrum. Parents may need reminding also of the PPTC’s failure to adhere to standards in relation to testing by their refusal to publish the specification of the GL Assessment test. Prior to Saturday’s tests parents are advised to contact their school to demand a copy of the specification. Any refusal to provide same may provide a basis for appeal if entry to the school was ultimately rejected. 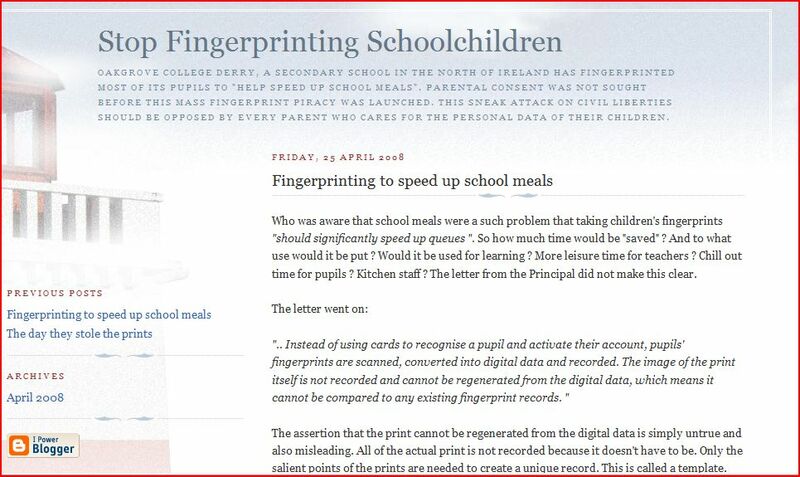 Ronnie Hazzard of Ballymena Academy and the PPTC has persisted in his refusal to supply a copy of the specification to PACE in response to an FOI request. Can parents have any confidence that their childrens’ interests will be best represented by a school which fails to comply with the FOIA law? 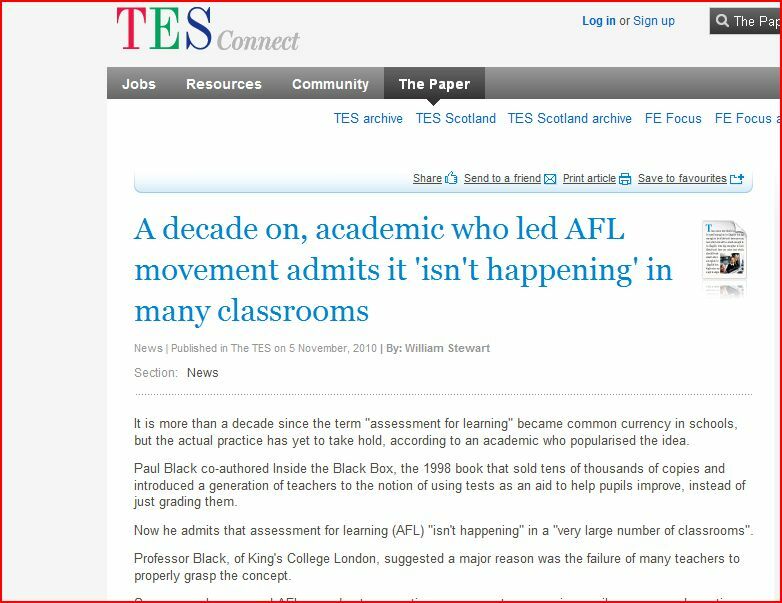 A decade on the academic who led the AFL campaign admits that the assessment method has failed to reach many classrooms. When a warning against Assessment for Learning was published by an academic in Northern Ireland cautioning that these methods were too radical, Martin Montgomery wrote a paper on behalf of the Council for Curriculum Examinations and Assessment (CCEA) in which he claimed that the Revised Curriculum wasn’t radical in the slightest and that the education academic was attempting to “scare” teachers. Who should parents trust; CCEA, the organisation which gets it wrong on a regular basis or the professionals at the chalkface? The Belfast Telegraph, www.belfasttelegraph.co.uk carried the headline; Keep out of it on the eve of this year’s AQE transfer test. The anti-academic selection SDLP’s education spokesman Dominic Bradley told Kathryn Torney that responses to a secret paper comprised by the self-styled Educationalists Advisory Panel including Michele Marken and Paul Hewitt were out of bounds. The attitute of both the newspaper and the politicians to post-primary transfer highlights their basic misunderstanding of the principle of academic selection for grammar schools. It is not a matter for consensus. There can be no compromise without betrayal of the principle. A grammar school without academic selection is not a grammar school. In England the Academies programme initiated by Labour and carried on by the Conservatives/Liberal Democrats has become the substitute for comprehensive schools. Some grammar school headteachers have, in persuit of more money, sought to transform their schools to academies. An academy has an all-ability, non-academically selective intake therefore the school becomes a comprehensive. Retaining the name grammar in the school’s name exacerbates the deception. Northern Ireland is now holding its breath for the first Montessori and Steiner schools to appear on the Shankill Road. Dawn Purvis MLA will be cutting the ribbon if her former colleagues in the PUP/UVF allow. 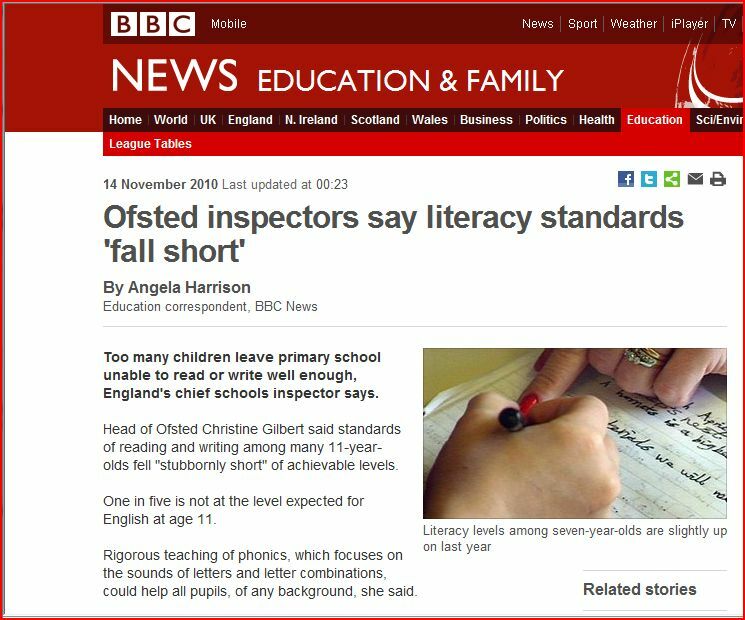 It will hardly come as a surprise that the Northern Ireland Sinn Fein Education Minister, Caitriona Ruane has intensified her attack on parental choice and measurement of numeracy and literacy attainment while enveloped in evidence that such standards are continuing to fall short. 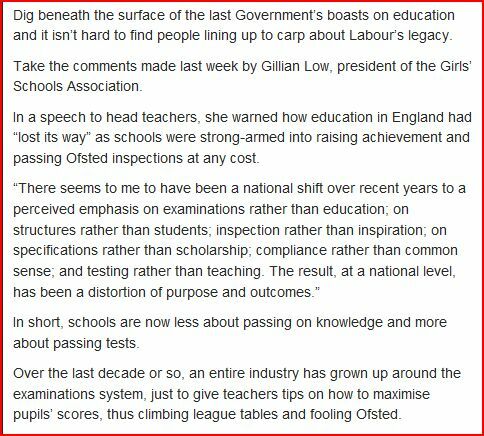 Those politicians, like her, who persist in attacking grammar schools and parents who believe in their value are seriously out of touch with reality. 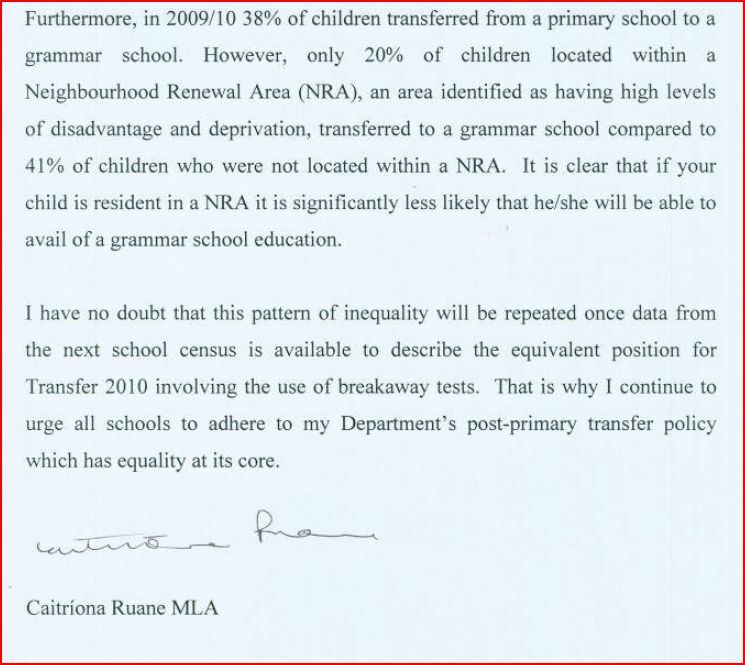 Ruane clearly is attempting to bully parents into choosing her neighbourhood comprehensive school diktat despite having selecting a grammar school for her own child. The bully is becoming increasingly frustrated,seemingly as stubborn as the poor levels of numeracy and literacy accepted by her teachers and fellow politicians. The DENI Circular on transfer: 2010-12 circular_2010-12_-_the_procedure_for_transfer_from_primary_to_post-primary_education_2011-12_pdf_2.62mb raises issues about the future of parent interviews. £2 million waste of schools money on ESA staff. Two million pounds is a mere fraction of the waste incurred by this stealthy body. No use by Simon Doyle, the Irish News Education Correspondent of the term “double-jobber” to describe Gavin Boyd the ESAIT chief executive and chief executive of the problem ridden exams board, CCEA. Frank Bunting northern secretary of the teachers union INTO rushed in to create a heirarchy of losers. Frank Bunting may need some remedial numeracy training and careful teaching of accounting principles.